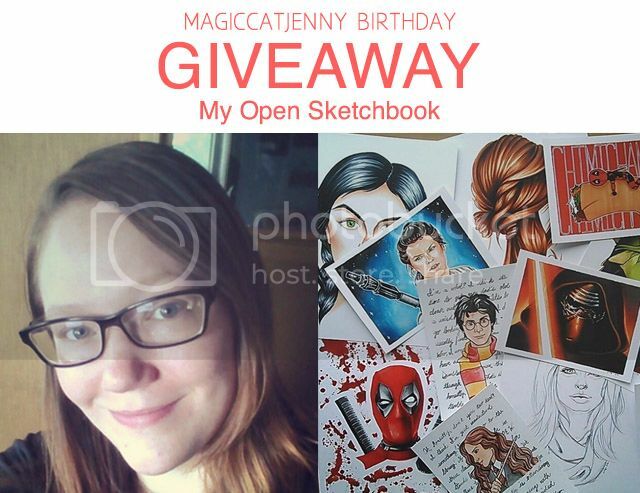 MagicCatJenny: Win a 5x7 Geeky Art Print! Win a 5x7 Geeky Art Print! This week's giveaway is for one 5x7 Art Print of your choice from Kay of My Open Sketchbook. Your choices are: Harry Potter, Hermione Granger, Ron Weasley, Kylo Ren, Rey, or Chimichanga Deadpool. Hi there, I’m Kay. I’m an artist, mum, and geek, living at the bottom of the mountains in New Hampshire. My days are spent with my five-year-old daughter having all sorts of homeschool and outdoor adventures, while my nights are spent making art or snuggling up with the hubs to catch up on the TV shows we are perpetually behind on. Other than art, I’m a big fan of playing D&D, reading, drinking cups of tea, and spending time outside. You can find me on my blog where I ramble about art stuff, adventures with my kiddo, and some geekier topics like comic/book reviews and such. To see more of my art, check out my Instagram for a lot of works-in-progress and sketches.